Inside one of Lille’s gorgeous metro stations. Photo by Martin Araya. In April 2006, my husband and I were both teaching two-week courses at a university center in Lille, a city in northern France. I was excited, knowing that Lille was a hub for the Eurostar train: the place where trains coming to and from London branch off and go either south to Paris or north to Brussels. We reserved a one-bedroom serviced apartment just an eight-minute walk from the Eurostar’s beautiful, modernistic station, Lille Eurogare. I must say it was a great location, and very easy to get to from London, even as we lugged two large suitcases. The “Sciences-Po” school where we were teaching was in a rehabbed portion of the city’s industrial zone a couple of miles from the apartment. The administrators told us we could get there by Metro, airily assuring us the trains were “very frequent.” They were quite right! It turns out Lille was the first city anywhere in the world to construct a driverless Metro system, which has now been operating with a good safety record there since 1983. I was amazed at the frequency with which these little two-car vehicles zip around the two-line system. On average, each one spends around a minute and a half on each section of track and half a minute loading in each station. Overall, you never need to worry about waiting; there are departures in each direction every two minutes! On our first day there, the Director of the school took us and a half dozen other professor out for lunch. For this august gathering, it was perfectly normal that we would all take mass transport. So as we set out from the Director’s office, we were all handed tickets for the Metro. We traveled a couple of stations along the line to the Director’s favorite restaurant, had a fine lunch, and were back at the school in time for the afternoon session. Following Lille’s successful experience, other French locations adopting the VAL concept include Toulouse (1993) and Rennes (2002), with airport applications at Paris Orly (1992) and a system linking termini at Paris Charles De Gaulle opening in 2007. Other applications in Turin, Chicago, Taipei and Uijeongbu (South Korea) have cemented the success of this distinctive and reliable light rail system. For a rider, the first encounter with a driverless system can be disconcerting. (I had mine with the people-mover at the Atlanta airport.) In Lille, when the trains weren’t too crowded, I liked to stand right up front and have the whole experience of the train whooshing through the dim tunnels and coming efficiently to a halt at the stations. (You can see a You-tube version of that experience, here.) 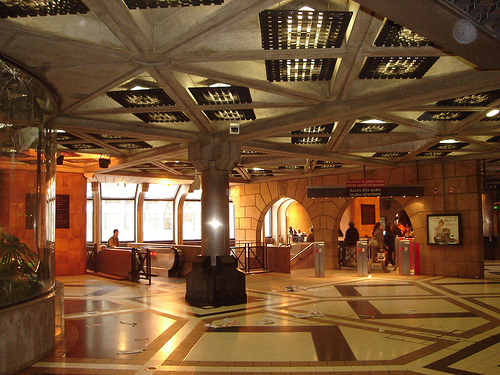 Many of the system’s stations are very beautiful. The one at the Fine Arts Museum even has elegant, glassed-in showcases with museum exhibits set into the walls of the platforms themselves. Our apartment was in a Rem Koolhaas-designed tower block located, as it turned out, right next to Lille’s central SNCF (French national rail system) station, which is also a key junction for the two Metro lines. During the week it was easy to use the Metro to do our work-commute and all the errands, exploring, and dining-out that we wanted to do during our brief stay in Lille. During one of our weekends there, we took the Metro out to Roubais, enjoyed the beautiful art museum that has been retrofitted into a large Art Deco building constructed, back in the 1920s, as a large municipal bath-house and swimming pool; and then we took Greater Lille’s venerable “Mongy” tram system from there back to the city center. On our other weekend, we took the SNCF trains a little further afield, to the historic city of Tournai, in nearby Belgium. In decades past northern France was widely derided as the country’s gritty, declining rust belt. But in recent years it has risen a lot in French popular esteem, it seems partly due to a continuing tradition of civic engagement in the region. Continued strong investment in mass transit systems is certainly a part of that. Could Autolib' Transform the City of Lights into a City of Electric Vehicles?